This may not be the most exciting product that we offer, but it certainly one of those must-haves for any business that sends a lot of letters or printed communications. Having professionally printed custom letterhead at the ready for your company makes it possible to produce a professional-looking document at a moment’s notice. Even if your business is not one that frequently sends printed communications, having a professional presentation for you communications can still come in very handy in some situations. Even if your business is not one that frequently sends printed communications, having professional letterhead can still come in very handy in some situations. The alternative is to create your own letterhead using a word processing program, but these never turn out looking quite right. In most cases, the recipient can tell that you just slapped it together. Put your best face forward with custom letterhead from Denver Print Company. Tell the world that you mean business, by representing your business as professionally as possible. Put your best face forward with custom letterhead from Denver Print Company. We offer a wide variety of paper stocks and shades, suitable for any type of business. Our select 12pt stock is the standard, but if you would like to try another variety of paper, please request a quote or give us a call. Creating a good letterhead is a little more complicated that just putting your company logo on the top of the page. 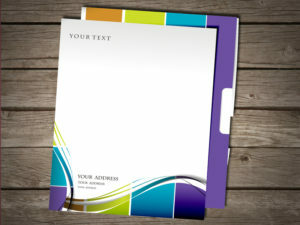 The entire design of the letterhead should reflect the branding of your business, while also being eye-catching. If you go too far, however, the design can become a distraction from the content on the page. It’s a tricky balance, and our in-house graphic designers know how to hit it just right. We can design something for you from scratch, or we have a number of templates available on our E-commerce site, denverprintshop.com. Take a look!